First time on the metropolitana. Oh the memories! Can one dedicate a love song to a city??! Because I sort of feel like serenading Milano right now and I’m sort of giggling to myself how dramatic I am about this, but…..Sinead O’Connors ‘Nothing compares to you’ keeps streaming to my head as I sit here and look at pictures of Milan. I’m so cheesy I am making myself cringe, but I carry on and as a result, I have decided to christen this entry with this song title. This is bad… it’s like a part of my chest is being heated like a glue gun and with every photo I click on, all these feelings are being stuck to it, ladening it heavier and heavier with every memory of. In my study room here in London I have hung three vintage photos of Milan from the 1800s and I stare at them often. Dramatic? Absolutely. Cheesy?! As cheesy as one can be. But, honest?? Very! My friend Nina knows how I feel. She’s also got Milano-febbre too that we can’t shake off. The sheer joy of being encouraged to litter during Carnevale. (This was week 5 in Milan). It’s been ages since I wrote on this blog, because after we left Milan I switched blogs and now write at Rascals Among Royalty. However, I skipped back into this interface to let all my Milanese folk know about a promotion I have been approached with. Ever heard of Get Your Hero??! I’ve never had a house cleaner before we moved to London, though I did have a lady that came once a week to help with my ironing and hence, she was my Iron Maiden. Since we got to London and since I started school, I have hired help around the house once a week to help me clean. Don’t tell the kids or Lumberg, but house-cleaning day is the best day of the week for me. I shave my legs for it. Each time after my helper leaves, I feel sheer jubilation being in my spotless house. It’s such a wonderful feeling-my house cleaner is in fact my hero, super cape and all. Anyways, Get your Hero is a company originally from Spain, but now helps clean homes in the Italian market. SO….if you want to enjoy your brioche and cappuccino a little longer on your terrace, or marvel a little bit more at the Cenacolo, or count every gargoyle on the Duomo , go to their site linked a few lines above, and enter in this code GYHBANDB, to get one hour of FREE house help. Flirt with the city while your hero flirts with your vacuum. Figurati!!! The trademark rubber flooring of all Milanese playgrounds. Miss this spot! The Expo is still on in Milan and I’m dying to find out how it’s going. Sadly, I don’t think I will make it to Rho, or Milan for that matter, before the Expo packs up and preps for Dubai in 2020. Should you be luckier than me and find yourself in Milan, may I suggest these tours to familiarise yourself with the wondrous city. Type in Milan as your city at the top and three tours will pop up for your wandering pleasure. A lot of research and love went into these tours and I know this because I wrote them. HA! It goes without saying that I am jealous of every single person in Milan today. And yesterday. And, tomorrow. The Albino Hulk’s first Halloween as a pasta chef, of course! To end my quick little note from across the channel, London is magnificent, but it’s true that nothing compares to you, Milano. However, I can’t lament about London too much either because Lumberg is correct when he tells me ‘girl, you better try to have fun no matter what you do!’ He’s no fool (and he never calls me ‘girl’). Now this song is stuck in my head. You??! Just before Corso Ticinese. Loved that ‘hood! 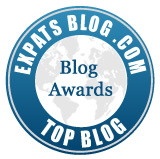 This entry was posted in Clean-freak, Holidays, Travel and tagged Canadian Expats in Europe, Expats in Italy, Expats in Milan, Expats in Milano, Get your hero, London, Pocket guides\. Bookmark the permalink.